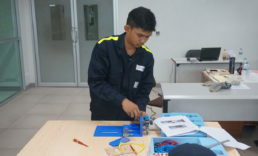 Mechatronics technicians work in the assembly and maintenance of mechatronic components and systems for manufacturers in plant engineering, mechanical engineering, systems operators as well as in service areas and for service providers in various industries. Mechatronics technicians are electrical specialists in the catergory of accident prevention regulations. Work with English language documentation and communicate in English.